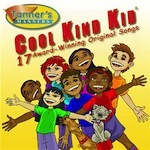 Cool Kind Kid® Audio CD Winner of more than 12 National Awards including Parents' Choice, Teachers' Choice Award, National Parenting Center's Seal of Approval, Creative Child Magazine CD of the Year! 17 original songs, each teaching a different social skill. Fun, sing-a-long music for home or classroom. Children 2-9 enjoy learning manners from these award-winning songs for kids by Steve Megaw. Some favorites include, “Magic Word Mambo,” “Rude Rudy,” “School Rules,” and “Dan’s Disastrous Dining Dilemma.” Instrumental Performance Tracks sold seperately (see 9318-DIA below). Click to hear samples.